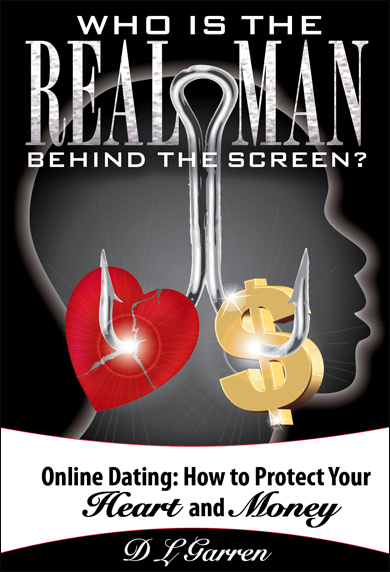 First-hand insight and information to keep your heart and money safe when online dating! Who Is the Real Man Behind the Screen is a must read for anyone who is currently or thinking about online dating, anyone who has friends and/or family that is online dating, and anyone that has been or knows someone that has been scammed via the Internet dating romance scam. In this book you will be learn the dangers entwined with online dating through intimate chats, emails, text “red flags”, “language”, “formats” and “scam stories” told from beginning to end that the scammers employ. You will learn how scammers gain your trust to swindle your money; the inner workings of the scamming world…told by scammers themselves, and how to identify tools of the trade scammers use to fool you. There are over 82 red flags. Without knowing how to recognize the “red flags” of scammers, it is not “if” you will be scammed, it’s “when”. DL Garren draws heavily from her chats with twenty-six scammers, three of whom revealed their real identities and became her inside sources. They taught her the inner workings of the romance scam and helped her navigate safely through her research. Do not miss this compelling behind-the-scenes trip into the workings of the scamming world. It will truly educate you! Online dating has become very popular for obvious reasons. It provides an opportunity to expand your search for that “perfect someone” from the comfort and safety of your home. It’s not the type of scenario where you expect to attract thieves looking to steal your money, but these predators enjoy a great deal of financial success because they know how to manipulate your heart and bank account. I spent a good part of my law enforcement career that spanned over 20 years investigating online fraud, and it involved people from all walks of life and socioeconomic groups. The one universal truth is that anyone can be a victim. Predators focus their collective efforts on learning what to say and do to legitimize their online identity and gain your trust. They share their methods with other predators to ensure further success. Any amount of money they can get, from $5.00 to $100,000.00 or more, is considered a victory because their single goal is to get your money. Who is the Real Man Behind the Screen? is an in-depth look at online dating fraud and some of the tactics predators use. The book follows the fraud from start to finish, with detailed chats, emails, websites, posted pictures, and most importantly the “red flags.” Red Flags are the subtle cues that something is wrong. These red flags are something the average person may overlook, but after reading this book you will see just how important they really are to prevent yourself from being victimized. The most dangerous attitude is, “It will never happen to me.” Predators expend almost unlimited resources to hone their skills to separate your from your money and will continue to use the anonymity of the Internet to target their victims. It can happen to you, and education is the key to keeping yourself safe. Knowing what to look for and the methods used by predators will help you to identify the true intentions of the person behind the screen. “This is the unparalleled “how-to” book for investigators and fraud experts. Diana is undoubtedly the reigning expert on online dating scams. I’ve personally seen the effort and diligence she put into her books, and no one else has the insider knowledge that she possesses. Working with private investigators and attorneys for over a decade has clearly developed a perseverance that’s unmatched in this arena. Diana not only captures the “how’s” of the scammers’ trade, she’s also managed to get them to confide in her and divulge the elusive “why’s”. TV experts claim to know how these scams work, but Diana isn’t talking theory. This is practical (and personal) knowledge. You will learn much from her. Stay tuned; more secrets will be revealed in her other books on online dating scams”. “Diana Garren has written a heart-wrenching story of a search for happiness gone awry, placing trust above all. This is a must-read for not only those who search for relationships on the Internet but also for investigators called up to assist. Ms. Garren has written the definitive primer and pleads her case exceptionally well for due diligence to avoid a disastrous emotional roller coaster ride. Read it, learn from it or weep”. “This book will awaken every one of your emotions! Who is the Real Man Behind the Screen is a rousing expose’ of online scammers. While reading, I became enthralled in the tactics of deception, agendas, and the reach of those who will drain not only the finances of their victims but their emotions and spirits as well. I was furious that the scammers have no limit to their greed or their plots. Who is the Real Man Behind the Screen will enlighten, warn, and prevent others from losing their money and the one thing you never gain back – time! It is a must-read for every person who has even thought about online dating or simply “friending” on the Internet. D. L. Garren allowed herself to be vulnerable in order to help prevent millions from drowning in disappointment, hurt, and shame”. “Diana is a diligent investigator (Merriam-Webster defines investigator as one who observes or studies by close examination and systematic inquiry). I, too, am an investigator, and I, too, fell for a scammer. Diana has put a lot of work into making this book informative and educational for everyone about the online dating scams. We talked about the scammers, as I confided in her about my escapade with one. She empathized with my pain and understood why I felt like I did. As we discussed the scams, I knew Diana had to write this book. I am a Certified Fraud Investigator, and I can attest that Diana has done a lot of research into the scammers. Diana has answered just about all the who’s, the what’s, the why’s, the where’s and the how’s, just like a detective investigating a case. She has gone the whole course on this. She even was able to get scammers to confide in her, the whole program. Not only are women victims of these scammers, men are too. Everyone will learn from Diana’s book, and knowing Diana, there will be more to come! Congratulations, Diana. I am proud of this accomplishment, I am proud of you for sharing your story. You will help millions of good women and men protect themselves from these scammers”. “I have been a Deputy/Detective for ten years and a Professional Private Investigator for 28 years. My specialty is organized crime and intelligence (LEIU), crime pattern analysis, sexual abuse and exploitation cases. I have my Ed.D. Doctor of Education in Human Sexuality, and it is from the perspective of my background that I want to applaud Diana Garren for the time and effort she has put into this book “Who Is the Real Man Behind the Screen.” Not only has she done a thorough forensic investigation without any bias, she has also identified the human element of the romance scam as being “molestation for money” and detailed how scammers mimic the manipulation and grooming tactics used by child molesters. Both the child molester and the scammer use the grooming process of trust, isolation, manipulation and “you will do this if you love me.” I highly recommend this book to those who are or want to online date. This book will provide you the knowledge to keep you and your money safe. I also recommend this book and the awareness program to those who have already been scammed. It is only through breaking the silence that you will no longer be a victim and be able to reclaim that part of yourself and help others do the same”. “Being an FBI Special Agent for 28 years and a Certified Fraud Examiner for 22 years, plus having a Bachelor’s in both Business and Psychology and a Master’s in Criminal Justice, I know a solid educational book when I see one. This is exactly what Who Is the Real Man Behind the Screen? is. This book was developed through personal experience, a thorough two-year investigation and inside knowledge provided by scammers themselves. Diana Garren has created an educational handbook that is filled with valuable red flags and practical knowledge that will help people protect their hearts and money, as well as an awareness campaign to break the silence and allow victims to become victorious. Understanding that all human beings are vulnerable to being scammed, I highly recommend anyone who has been scammed through a dating site, who is currently or contemplating online dating, along with law enforcement and investigators to read this book. Once you start reading it is almost impossible to put down as you follow the emotions between Diana and the scammer as he weaves a web of deceit. The reader will get so caught up in the raw emotions that they will be thankful they are reading these in the book instead of discovering the deceit for themselves in an online romance. Once the reader learns the techniques of the scammer, they will be able to protect themselves from a similar fate”. “Diana Garren has written an accurate and astonishing account of the world of the online scammer, those individuals who exploit and lure women into emotional relationships that can wreak havoc, not only on the hearts but the wallets of the innocent. In Who is the Real Man Behind the Screen Diana’s honesty, courage and integrity shines brightly, as does the spotlight she focuses on these criminals. This book is an extensive and enlightening investigative report on a dark and despicable enterprise, most of which is cast from Nigeria. “It is estimated that as many as 58% of women and 48% of men in the United States engage in online dating. Diana Garren’s book, “Who is the Man behind the Screen?” should be mandatory reading for every single one of these dating site clients. Not only that, but every investigator in the country who has ever dealt with one of these dating scams owes it to their clients to be familiar with the tell-tale signs that a scam is being or about to be committed. To those who have fallen victim to such a crime in the past, you will see from this book that you are not alone. To those who may unwittingly engage with an online fraudster in the future – commit the invaluable real-life information to memory and refuse to be a victim. Diana has herself stepped into the light in order to reveal the scammers’ “tricks of the trade.” While most others would rather stay silent and not let it be known that they themselves had been swindled, Diana courageously bares her soul and shares with us the way in which she was used. In much the same way as “Penn and Teller” have become infamous for revealing magicians’ secrets, she takes us by the hand and navigates us through the inner working of an online scammer. She methodically penetrates well constructed webs of deceit and strips away layer by layer of subterfuge, until the criminal is left shivering and unprotected in the cold light of day”. “Having been a private investigator for more than thirty years, I have heard many stories from very intelligent people who have been swindled by skilled criminals. Some came to mind as I read Diana’s own account of how she plunged headlong into victimhood. Knowing well her strength of character, professionalism, and inquisitive nature, I found it hard to fathom how Diana was taken. In her book she frankly explains how her emotions overrode her sensibilities, right in line with the con artist’s plan as he sized up and exploited her. I applaud her honesty in recounting her experience, her tenacity in turning the table on the scammer, and her devoted investment of time and money to create this roadmap that is certain to help others detour around the warning signs of online dating fraud”. “Who is the Real Man Behind the Screen?, and Is It a Real Soldier Behind the Screen?, are two of the most riveting works I have ever read. If I did not know Diana personally, and know the passion with which she has pursued these books, I would have sworn I was reading works of fiction. There is only one way someone could write about this horrific crime with such conviction — to have been the victim of such. Diana took what could have been—for some people—a life-ending experience, and with dignity, turned her crisis into these heart-wrenching guides. I recommend to anyone who might be even remotely contemplating online dating, read these books! Law enforcement officers, private investigators, fraud examiners — these books should be required reading! Congratulations, Diana, on this accomplishment. I know it has ruled your life for several years. Thank you for allowing me to tiptoe briefly into the project with you. I wish you love and Godspeed”. “This is a book for smart people. People who already know the dangers of online dating and would never dream of sharing personally identifying information with a stranger. People who know what “phishing” is and who delete suspicious messages and ignore unsolicited email offers. This is a book for people who, upon making a new online connection, immediately Google search their new friend to verify their identity; people who cross-check Google, LinkedIn, Facebook, Twitter, and whitepages.com to confirm that the person they are connecting with online is really who they say they are. If you are smart enough to do all those things, this book is definitely for you! Diana Garren is a smart woman. She did all those things. She got scammed anyway. Her book is compelling because she lays bare the harsh realities of online dating scams, the harshest of which may be that you never really know who is behind the screen. No one does. Ms. Garren’s book cuts through the romantic notions and wishful thinking that can impair the strongest among us and make us easy prey. Ms. Garren writes with honesty, compassion, and utter commitment to her mission. Hers is a rallying cry to awaken the gut instinct and native intelligence we rely on for our wellbeing and survival. This book will change you for the better”. “What makes fraud different from other crime is the response of victims. Most victims of crime immediately report the incident to the police. In online dating fraud, there is a sense of embarrassment and a reluctance to acknowledge that one has been taken. As a result, many online dating frauds are not reported, making the continuation of the scam easier and more profitable to the scammers. Diana Garren was a victim of online dating fraud. Instead of keeping the details of how she was separated from her money, she bravely went forward gathering additional information to let others know how online dating schemes work and who is behind them. Her efforts detailed in this excellent book now empower others who find themselves in similar situations. Readers of this book are better equipped to protect themselves with the advantage of knowing the red flags”. I highly recommend this book to all of those searching for a relationship with others online, so they can protect themselves against wolves in sheep’s clothing. I also recommend this book to law enforcement investigators to provide them with a deeper understanding of not just how fraud schemes are implemented but a more complete understanding of online dating fraud in general”. “If you are serious about protecting yourself from scammers, Who Is the Real Man Behind the Screen is an important tool for you to add to your survival kit. Do yourself a favor and buy it. Better still, buy the book, visit her awareness campaign and get yourself to one of Diana’s workshops. Whether you are learning from her in person or from her book, Diana’s teaching style is straight-up, fact-filled, enriching, joyful and thorough. This energetic and generous author is passionate about her craft; her enthusiasm is infectious. I do not know how she does it, but her style of communication imparts confidence to the reader whether you are vulnerable or have been scammed. Better still, she tells you how to recognize potential scammers. Because she has walked the road of the scammed, her advice is based on experience, inside sources and research. She is honest, she is human and she wants you to be safe. Kudos to you, Diana! I look forward to more books from you”. “Diana went deep. Real deep. So deep that I was concerned for her safety and well-being. During the last few years she used her natural skills and determination to uncover the TRUTH about online dating scams. She did this to prevent the very thing that happened to her from happening to YOU. You must read Who is the Real Man Behind the Screen? The knowledge she has gained from the Private Investigation, Security and Surveillance industries from years of marketing and business development with them put her in a unique position to tackle online dating scams with all the resources of a team of professionals and the subtlety of a double agent. Unbelievable what is happening, worldwide”. “Trusting and falling in love… online! I’ve heard it happens to a lucky few. I personally knew a couple who met online and who are happily married today, living their dreams of having a family and a blessed life together. We have all heard many stories like that. You do so want to be part of that lucky few… after all, you do your homework to check things out. However, unknown to us, the scammer makes sure he has backstops to cover himself, his lies, and his scams! The scammer tells you what he knows you want to hear, but he does not stop there. Diana has revealed her heart in telling her story in order to help others. She appears vulnerable, yet she is a strong and courageous woman. Diana tells you how she fell in love in spite of feeling some things were not quite right. The truth in her story and her research will set others free to be strong, courageous, and knowledgeable in matters of the heart and their finances when dealing with people on-line. Diana’s story is a must read for all people, young and old; those looking for a relationship, or those looking for a deal that’s “too good to be true”. A remarkable story, rich in unknown details about a vastly lucrative business. This is the perfect book for anyone online dating who wants to know what to look for in a Scammer. It is unbelievable how the author has channeled her hurt, pain and embarrassment into an extraordinary work and a wealth of information that will truly help those who are innocently seeking real relationships online. Read this book and avoid a lot of heartache and trouble”. “Diana Garren’s book Who is the Man Behind the Screen? is a must-read for every person. Even if you yourself are not attempting to meet people online, you have friends and family who are. We have several friends who met online and are now married. Those are the success stories. Far too often the story goes like Diana’s experience, where the victim has been deceived, emotionally abused, and financially defrauded. I had no idea this type of crime was so prevalent, and after reading Diana’s book, I have a much better understanding about how to protect myself from any type of online crime, not just Internet dating. I have known Diana many years. I am continually impressed by her passion and willingness to be transparent to save others from this fate. Read this book and tell your friends about it. Thank you, Diana, for this imperative work”. “Who Is the Real Man Behind the Screen? and Is It a Real Soldier Behind the Screen? are enlightenment to the old biblical saying, “Beware of false prophets. They come to you disguised as sheep, but in their hearts they are vicious wolves.” Diana brilliantly combines her regrettable encounter with an unscrupulous scammer with her years of experience working with private investigators and attorneys to create scholastic exposes of online scammers’ tradecraft. She uncovers how scammers employ the internet and social media to find their targets and manipulate them to extort their money, pride and innocence, while, like false prophets, disguising their true malevolent intentions. I applaud this passionate author’s bravery because despite great emotional and financial loss, she found the courage to write these books. Her diligent efforts and example will not only educate and equip others with the advantage of knowing online scams red flags and scammers’ trade craft, they will empower people to protect themselves from the emotional, physical and financial hardships of a online scam victims. These books are MUST READ books for persons engaged in online dating, everyone who has a social media account, and professional private investigators, law enforcement officials and investigative reporters entrusted to help protect innocent sufferers from online predators”. “Who is the Real Man Behind the Screen is a must read for anyone looking for love with online dating services or social media groups. D.L. Garren shares her experience and explains in detail what to look out for so you can avoid being scammed. I strongly recommend this book to everyone so you can learn from her experience instead of your own”. — Dianne Gregg, C.C., Author, The Hidden Dangers of Soy. Diana has done her research and produced knowledge that every woman should acquire. I get a call at least 3 times a week at my agency from women who have sent money to these con artists. Now I will refer them to the expert! “A MUST READ for anyone contemplating online dating. I would go further and add, for ANYONE who has an account on any social media platform. Eye opening and informative, this book connects the dots on how scammers find their “clients” and how they manipulate and extort while hiding behind a computer screen. It is astonishing to learn the extremes these people go to – casting spells, using emotional guilt and loving dialogue – preying on people who want to find a loving relationship, cleaning out their bank accounts and destroying future financial security. I worked as a researcher for a Private Investigator and cases of this type were the norm; people who had lost thousands of dollars, suffered the humiliation of being duped, and dealing with broken emotions looking for restitution from a scammer thousands of miles away that would never be located or prosecuted. This book is a definite “Bible” for all in the business of investigation of online crimes and scams so they can better understand how these scams work. I have a few friends that have online dating accounts and I would LOVE to give them copies”. “Online Dating Scams are a dishonest way to make money and they are conducted by deceiving people. This criminal act has been and is still very in vogue in Nigeria. It has left so many victims in a state of depression, some even to the extent of committing suicide. Can you imagine someone who claims to love you and in the end they swindle you out of millions of dollars. There is always an end to evil acts and this one (online dating scamming) is no exception. People need to read “Who is the Real Man Behind the Screen?” NOT because it just another book on the market, but because it is written with in-depth research, real life occurrences and much more, with its sole aim of eliminating the online dating scamming menace. Above all, the author is a passionate, intelligent, dedicated woman who has deemed it fit for the public to be highly educated on the tricks these scammers use to hunt and hurt their victims”. “This book is a cautionary tale of one woman’s short but intense encounter with the shadowy side of the Internet. The other day Diana Garren called me and in the course of the conversation told me she had written a couple of books. She described this first-hand account of her encounter with online dating. As I listened I recalled my own experience with the “Sweetheart Swindle” that I have encountered several times over the years. It seems that sweetheart swindle scams and Nigerian 419 scams have coalesced into the near perfect method of extracting money from the unsuspecting aided by the Internet and technology. This book is a detailed account of Diana’s first internet dating experience. What she learned, at great expense to her heart and her pocketbook, is a worthwhile read for those thinking about entering the Internet dating scene. This book is intentionally detailed because unless you see each detail you will continue to say what most folks say: “That couldn’t happen to me.” For over thirty years I have heard that phrase from victims. It did happen to them. This book explains dating scams and the warning signs to look for so you can keep your hard earned money. Diana she was able to convince several of the scammers to cooperate with her, in a manner of speaking, and tell their personal stories as well as revealing exactly how these schemes work. I found it interesting to learn the hierarchy that exists in this endeavor. This not just a bunch of folks working independently; it is an organized effort to extract money, complete with scripts and an organizational chart. D L Garren is the Founder and CEO of True Perceptions, Inc®, a business consulting and perception management firm based in the USA. For more than a decade she has consulted in the areas of business development, sales, marketing, branding, and perception management for investigative agencies, many of whom are fraud investigators, retired Law Enforcement, FBI, CIA and Secret Service, security companies, process serving companies, and attorneys. There are over 90 red flags listed in her books, live chats, emails, and text so people can follow the scams from beginning to end. The books are written in such a way the reader feels every emotion. Diana’s expertise will help you help your family, friends and client’s protect their heart and money when online dating. 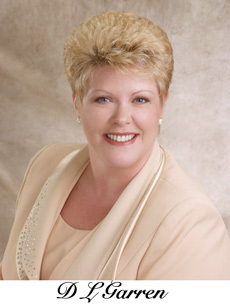 Diana is a well-known speaker throughout the United States. She is known for her sincerity, enthusiasm, and her no-nonsense approach. She speaks truth because she knows it is truth that makes a change. Diana can be reached at www.dlgarren.com and www.silentvictimnomore.com and info@silentvictimnomore.com. © 2017 – 2019 Silent Victim No More. All Rights Reserved.